When you are a short haired bride, you may wonder if you are going to be able to wear a special headpiece on your wedding day. While your options may be fewer than if your hair was long, there are actually some truly gorgeous adornments for short hair. 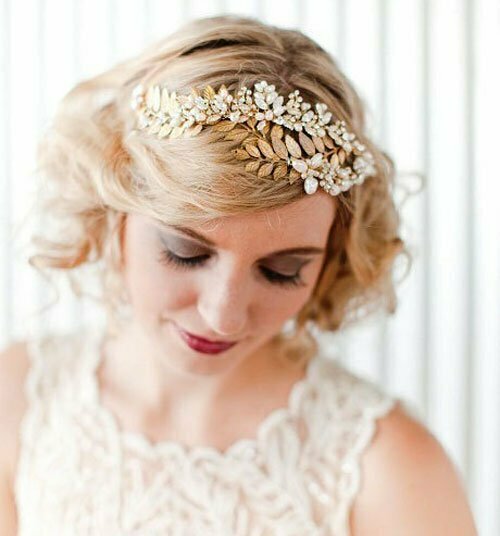 These are some suggestions on the most fabulous headpieces for short haired brides. Veils are one of the loveliest accessories for a bride, but they can be challenging to affix to short hair. Any bride who has tried to secure a long veil in her short hair has probably experienced firsthand how the veil simply slides down the back of her head. A wonderful alternative to a long veil is a short cage veil made with a wide netting. It is a very chic look with a retro flair to it. One of the prettiest ways to attach a cage veil is with a little barrette on the top of the head. Look for one that is decorative, such as a bow with a piece crystal or rhinestone bridal hair jewelry on it. This elegant style looks especially nice with a smooth and sleek hairstyle. Sometimes when you are working with less hair, you might want to consider creative options for your bridal hair jewelry. If you adore the look of a sparkly crystal clip or barrette, but it slips out of your hair, try anchoring it in the front of your hair at the part. This is a very pretty way to bring the attention to your beautiful face, right where it belongs. Often you can have bridal hair jewelry modified to suit your needs. For example, if you found a set of hairpins that you really love, you might think that you are simply out of luck, as they need to be anchored into an updo. However, if the pieces that have caught your eye are handcrafted, you might be able to order a replica of the hairpin design on small alligator clips, which work well for short hair. One style that is a guaranteed success for a short haired bride is a headband. Headbands are one of the hottest trends in bridal accessories this season, so you will find yourself with many fantastic pieces from which to choose. Soft fabric headbands are especially big, and if your hair is at least as long as a bob, this can be a beautiful finishing touch for you. Look for a wide silk headband that can be tied around your hair with soft tails flowing down the back, slightly to one side. You can keep it very simple, or add an embellishment like a crystal or pearl brooch for even more style and a unique flair. If you prefer a more dainty headpieces, a delicate headband is lovely for any short haired bride. Pieces with an open and airy design are wonderful, particularly when they have a nature inspired design, such as a leaf and vine motif. These headbands are usually handmade from Swarovski crystals and freshwater pearls, secured to a very narrow frame with sterling silver wire. The headband frame is generally a lit bit flexible, so you can really mold it to fit the size and shape of your head for a non-slip fit. Short hair can be just as lovely on a bride as longer locks. There are plenty of gorgeous hairstyles and headpieces available to short haired brides these days, so there is no need to grow out your pixie or bob. Embrace the modern and chic look of short hair and the fabulous hair jewelry that will help you to shine on your wedding day.